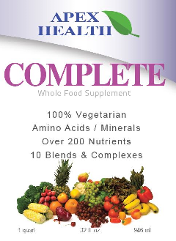 The most complete supplement available, over 200 Nutrients, Minerals, Vitamins, Sea Vegetables & MORE. Apex Health's first all-inclusive daily liquid multivitamin contains the highest quality ingredients. The addition of fiber and 10 blends and complexes designed to enhance the whole food based vitamins, minerals, enzymes, and amino acids in this formula makes Apex Health Complete one of the most comprehensive multivitamins available. Sweetened with agave cactus nectar and scrumptious fruit juices, Apex Health Complete is a great-tasting multi-vitamin liquid for the entire family. Recommended Use: 1 oz daily, may be taken with food. Shake Well. Some settling is normal. May be mixed with juice or water. Refrigerate after opening. As with all natural products, color and taste may vary. CONTAINS NO ARTIFICIAL COLORING OR FLAVORING, STARCH, SALT, YEAST, CASEIN OR MILK DERIVATIVES. Proprietary Blend: Wild Blueberry Vaccinium Angustifolium (fruit) Extract, strawberry fragaria chiloensis (fruit) powder, cranberry vaccinium macrocarpon (fruit) powder, wild bilberry vaccinium myritillus (fruit) extract, elderberry sambucus nigra (fruit) extract and raspberry rubus idaeus (seed) powder providing the anthocyanins, malvidin, cyanidin, delphinidin, and petunidin in biologically active ratios. MSM (Methyl-sulfonylmethane) 99.9%, TMG (as betaine anhydrous), Glucosamine Hcl USP, Grape Seed Extract (vitis vinifera) (95% polyphenols), Rhodiola Rosea (3% rosavins / 1% salidrosides), Hyaluronic acid. Hawthron Berry (fructus crataegi) 4:1 Extract, Acai Berry (euterpe oleracea mart) 4:1 Extract, Horse Chestnut (aesculus hippocastanum) (seed), Red Korean Ginseng (radix panax C.A. meyer) (root), Ginko Biloba (24/6), Eleuthero (eleutherococcus senticosus) (0.8% eleutherosides), Coenzyme Q10 (as ubidicarenone), Garlic (allium sativum) (cloves). Gojiberry (lycium barbarum) extract, Suma (pfaffia paniculata), Alfalfa Extract (medicago sativa), Alpha Lipoic Acid, Burdock Root (arctium minus). Apex Health Products MADE IN THE U.S.A.